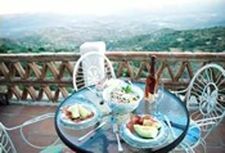 Situated in the Alpujarras valley and close to the Sierra Nevada National Park and located in Mairena, Balcones Alpujarra Apartments feature beautiful mountain views and are equipped with flat-screen TV and Internet. These 1, and 2-bedroom apartments include a living room with sofa and traditional fireplace. 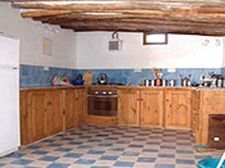 Each kitchen-dining area includes a cooker with hob, microwave, fridge and a dining table. 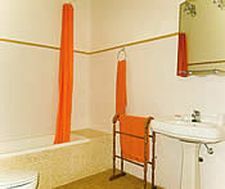 Private bathrooms are equipped with a shower unit. Free towels and bed linen are included. (Hover over images to enlarge). A small supermarket is within 50 metres walk. 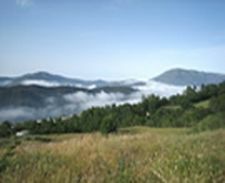 The surroundings are mountainous and offer excellent opportunities for hiking, climbing, and cycling. 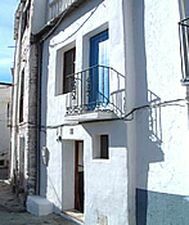 The Balcones Alpujarra Apartments are one and a half hours driving to the city of Granada, and to the coast and the city of Almeria is a one hours drive. 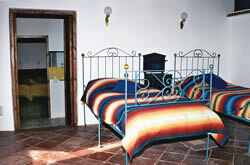 Casa Naranja studio is a beautiful and comfortable apartment, set in a traditional but recently built country house. 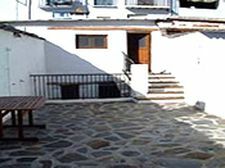 The apartment is situated just below the village of Válor (altitude 2.953 feet / 900 metres) at walking distance of bars, restaurants and supermarkets. 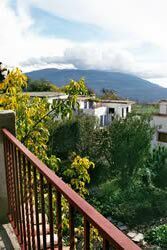 The apartment has its own entrance and a large terrace with marvelous views on the Alpujarra valley and the sea (Hover over images to enlarge). 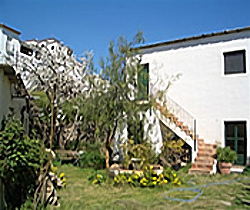 Casa Naranja studio has a wonderful garden of about 0.74 acre / 2995 square metres, with all kinds of flowers and trees, such as oranges (after which the house is named), olives and palms among else. There is also a small swimming pool with spring water. 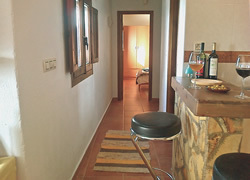 The apartment has an under-floor heating system, guaranteeing a pleasant stay during the winter season. 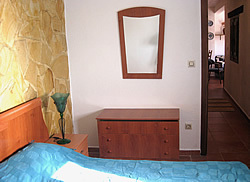 The comfortable Viña y Rosales apartment is located in Mairena. Downstairs is a living-room with open kitchen, equipped with hob, oven and a fridge; and a spacious covered terrace with an open fireplace. 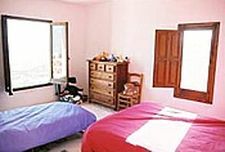 Upstairs is a comfortable twin bedded room and a bathroom with massage shower. 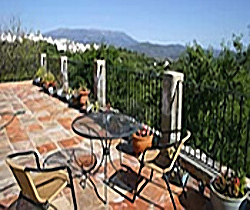 there is a large roof terrace with magnificent views. The village has two shops offering all basic needs (Hover over images to enlarge). 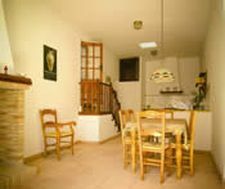 The apartment is for rent for two or four persons. The bathroom is between two bedrooms, the Indigo and the Hénil, perfect for a family: parents with two children or two acquainted couples. There are several restaurants located in the surrounding villages. The coast is an one hour drive. The ski resort of Puerto de La Ragua is a half hours drive (open during winter). The cities of Almeria and Granada is a one and a half hours drive; Malaga airport three hours. 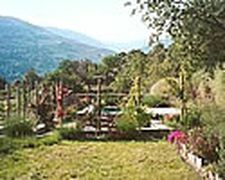 Annual (per week): two persons € 350,00 or four persons € 450,00. 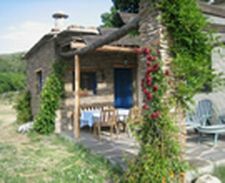 The cottage (cortijo) Piedras Enciso is situated on a private land of 6.2 acres / 2.5 hectares within the Natural Park of Sierra Nevada, at an altitude of 3.996 feet / 1.218 metres. 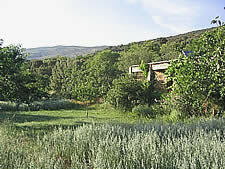 There are magnificent panoramic views all around the estate. 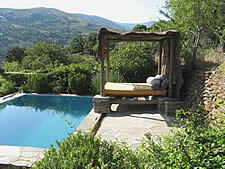 In the garden surrounded by rose arbour is a swimming pool and in front of the cortijo is a large veranda. 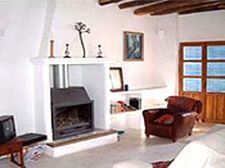 The interior of the cortijo consists of a living room with an open kitchen and fireplace, two double bedrooms and two bathrooms. 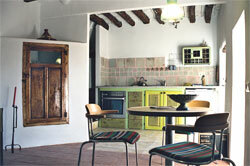 The cortijo has a fridge, oven and hob and two gas heaters. Firewood is supplied during winter months. 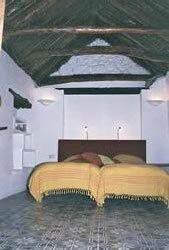 There is a very reliable solar system supplying all necessary electricity in the cortijo. 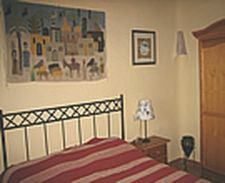 Bed linen, garden furniture and a collection of English reading books are provided (Hover over images to enlarge). Laroles is the closest village having all basic facilities. There are several restaurants located in the surrounding villages. The coast is an one hour drive. 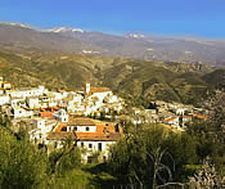 The ski resort of Puerto de La Ragua is a half hours drive (open during winter). The cities of Almeria and Granada is a one and a half hours drive; Malaga airport three hours. Monthly lets available on request. Discounts for more than a two week stay are available. Details on request. 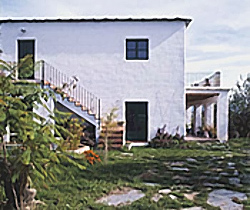 Casa La Morera is a 17th century restored house and is situated in the little village Jorairátar, in the Contraviesa. 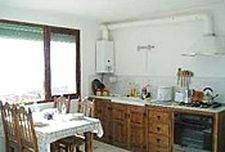 The house is spacious having high ceilings and well equipped. 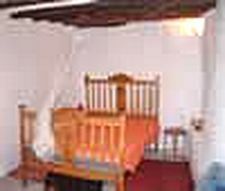 There are four bedrooms available; two are twin bedded and two having single beds. There are two bathrooms; one with a bath and the other having a shower. Blankets, sheets and towels are included. There are two sitting rooms, one has a television set. 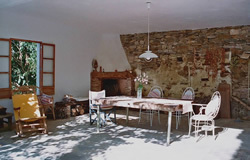 The well provided kitchen / dining room has an open fireplace and opens on to a terrace. There is a laundry room. 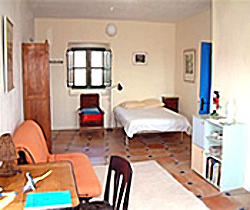 There is an electric heater in each room (Hover over images to enlarge). 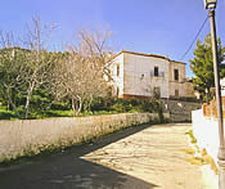 Ugíjar is a larger town close by and has all possible convenient facilities, The coast is half an hours drive. The highest mountain El Mulhacén is very nearby; skiing is a little under one hours drive (during winter). 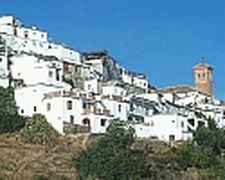 The cities of Almería and Granada is an one and a half hours drive; Malaga airport three hours. 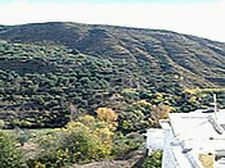 The cottage (cortijo) El Ciruelo is situated on a private land of 1.36 acres / 0.55 hectare within the Natural Park the Sierra Nevada, at an altitude of 4593 feet / 1,400 metres and excellent for quiete retreat and wonderful walks with admirable panoramic views all around. 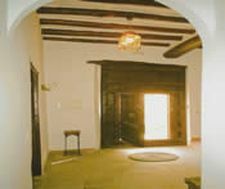 The interior of the cortijo consists of a living room, a dining room with an open kitchen and fireplace, one double bedroom and one bathroom. 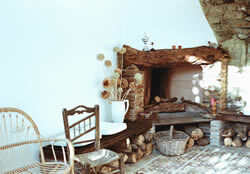 The cortijo has a fridge, oven and hob, two open fireplaces and electric heaters. Firewood is supplied during winter months. It is connected to the electric main grid of the village of Pitres. 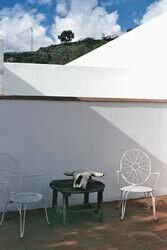 Bed linen and garden furniture are provided (Hover over images to enlarge). 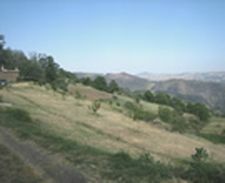 Pitres is the closest village with all the basic facilities. There are several restaurants located in the surrounding villages. The coast is an one hour drive. The highest mountain El Mulhacén is very nearby. Skiing is available under one half hours drive (during winter). The cities of Almeria and Granada is a one and a half hours drive; Malaga airport three hours. Prices are for 2 adults per week. Two pets are welcome. 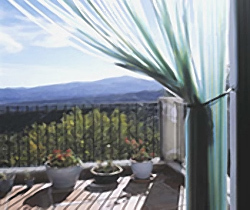 Casa Mirador Alta has wonderful panoramic views onto the valley. 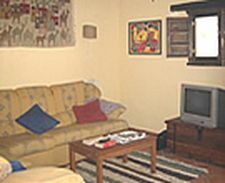 The house is divided into two seperate apartment sections, with all the necessary modern facilities. 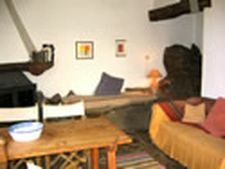 Each apartment has a livingroom with an open kitchen and a woodburning stove, a double and a single bedroom. There is a large roof terrace. 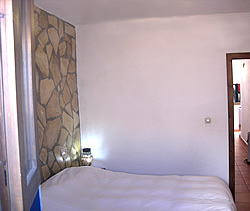 Bed linen and towels are provided for. The use of gas and electricity is included in the rental price. 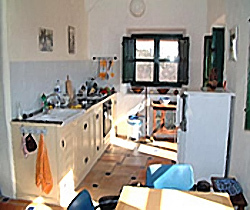 Both apartments may be rented together or seperately (Hover over images to enlarge). 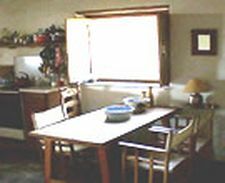 Laroles is the closest village offering all basic facilities. There are several restaurants located in the surrounding villages. The coast is an one hour drive. The ski resort of Puerto de La Ragua is a half hours drive (open during winter). 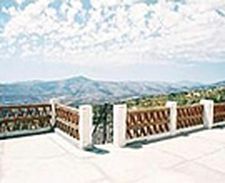 The cities of Almeria and Granada is a one and a half hours drive; Malaga airport three hours. 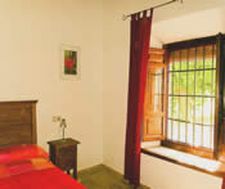 Casa Raj is a tastefully restored village house looking out on mountaines scenes. It has four floors and two entrances. 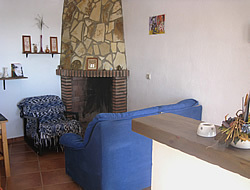 a livingroom with a imposing fireplace and a large seperate kitchen equipped with all necessary utilities. Outside the kitchen is a large terrace. 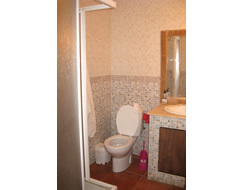 There are two double bedrooms and two modern bathrooms. 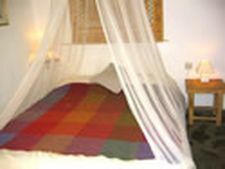 Bed linen and towels are provided for. There is a selection of English books, videos, CD's. Firewood will be provided during the colder months. Picena has a large open air swimmingpool, five minutes walk from the house, which is open from mid July to the end of August (Hover over images to enlarge). Laroles is the closest village with all basic facilities. 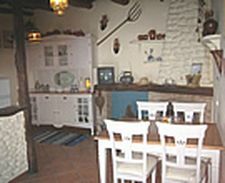 There are several restaurants located in the surrounding villages. The coast is an one hour drive. The ski resort of Puerto de La Ragua is a half hours drive (open during winter). 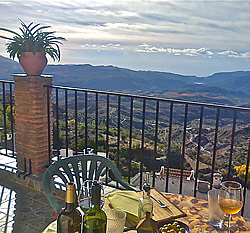 The cities of Almeria and Granada is a one and a half hours drive; Malaga airport three hours.